A couple days ago I was out tooling around Tsawwassen on my old two stroke, doing my bit to warm the globe, when I found myself following a beautiful white Rolls Royce Silver Cloud II. Achingly beautiful cars, if you’ve got two feet and a heartbeat, it’s damn near impossible not to be drawn towards these things. 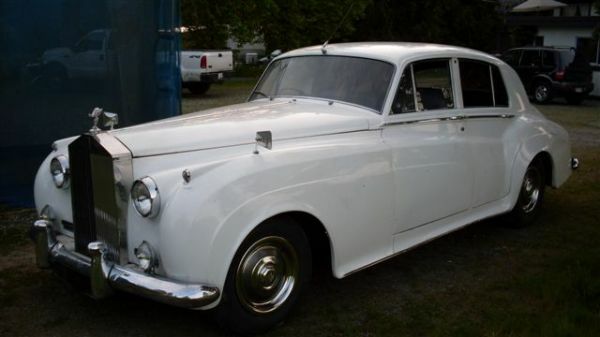 Although the straightedge lines of the windows and grille might seem incongruous with the flowing lines of the fenders, there’s something about an old Rolls under way that’s about as breathtaking as a car can be. Largely unchanged externally from the Silver Cloud I that predated it, the Silver Cloud II’s big claim to fame was the new 6.2 litre V8 found under the hood. Replacing the 155 horsepower inline six, the new V8 quickly earned a reputation for impressive performance, capable of pushing the 2.1 tonne sedan up to an astounding (for its time) 114 miles per hour, and doing so with something approaching alacrity. However, contemporary reviews cited the engine’s intrusive noise and slightly rougher operation as merits of the old six cylinder that were missing from the new eight. Additionally, the shoehorning in of the wider V8’s configuration made maintenance an ugly affair, with simple spark plug changes requiring the removal of the right hand side front wheel. 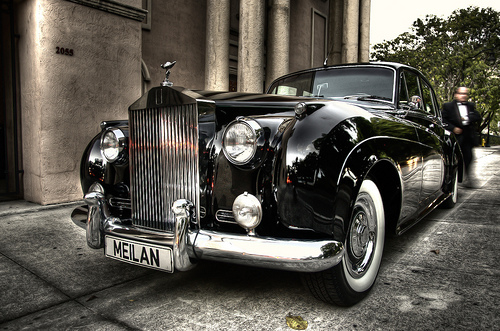 However, although its contemporaries may have found the Silver Cloud’s evolution to be a less than immaculate affair, the popular Silver Cloud II is still a Rolls Royce. So, to find one in running condition for just $17,500 is a situation that definitely deserves some investigation. But, one should be wary to temper any excitement with a healthy dose of reality: restoring a Rolls Royce isn’t a task to be taken lightly. These cars were almost entirely hand built and hand assembled, and that means parts will very rarely fit from one car to another. Be it a body panel or an interior trim piece, it’s pretty much a given that some fitting will be required, and although the powertrains of these old beauties may have been mechanical marvels, they were also incredibly expensive to maintain, leading many to endure years of neglect. And do I really need to mention the particularly cliché rumours/truths of old British wiring? This particular example seems to have fallen prey to at least some of those issues, but at least it’s running, which should help diagnose the gremlins preventing it from starting up more willingly. As for the external and internal condition of the bodywork and cabin, one would do well to research Rolls Royce restoration techniques, as many purists generally believe that preservation is a better approach than restoration. Instead of refinishing and replacing things, they typically clean and maintain them in an effort to retain the brand’s incredible craftsmanship, and this car looks like a perfect candidate for just such an undertaking. However, if you should buy it, don’t be surprised to find yourself being following around by a guy on an old Yamaha enduro. This entry was posted in Vancouver by dfritter1. Bookmark the permalink.